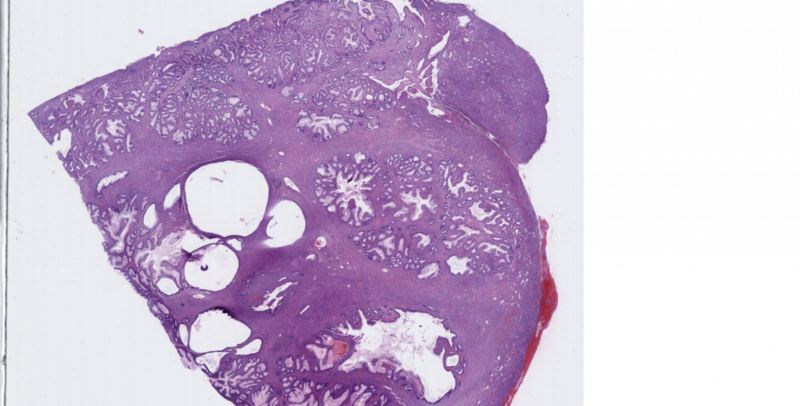 Histology: The large polypoid lesion seen on this histologic section was grossly attached to the cecal wall by a thin stalk. The surface of the lesion is lined by bland-appearing colonic mucosal glands with regions of acute inflammation and ulceration. The center of the polypoid lesion contains irregular but benign-appearing colonic glands; abundant goblet cells are present, and the cells have low nuclear-to-cytoplasmic ratios (i.e., there is no dysplasia). The stroma located in between the disorganized colonic glands contains bland spindled cells with blunt-ended euchromatic nuclei, occasional punctate nucleoli, and no atypia. There are numerous eosinophils within the stromal space, as well as prominent thick-walled blood vessels. There is a vague suggestion of “onion skinning” around the blood vessels, that is, perivascular edema with zones of spindled cells resembling onion peels. Discussion: Inflammatory fibroid polyps are mesenchymal lesions of the gastrointestinal tract that are centered within the submucosa. Although traditionally thought to be most common in the stomach and small intestine, they can also occur in the large intestine as is seen in this case. The classic histolofic features are the presence of bland spindled cells, thick walled vessels with perivascular “onion skinning,” and prominent eosinophils. Inflammatory fibroid polyps can contain varying degrees of spindled cells within the stroma such that the differential diagnosis can vary widely depending upon the degree of cellularity. The differential diagnosis of lesions with prominent spindle cells includes gastrointestinal stromal tumor (GIST), fibromatosis, and schwannoma. Notably, inflammatory fibroid polyps are immunoreactive for CD34, as are GISTs; however, in contrast to GISTS, inflammatory fibroid polyps are negative for CKIT/CD117 and DOG1. Inflammatory fibroid polyps can become secondarily inflamed and ulcerated due to traumatic injury within the luminal gastrointestinal tract; when large, they can cause bowel obstruction. In contrast, inflammatory polyps (not inflammatory fibroid polyps) are pseudopolyps that occur in the setting of diffuse inflammation due to inflammatory bowel disease. 1.Daum O, Hes O, Vanecek T, et al. Vanek’s tumor (inflammatory fibroid polyp). Report of 18 cases and comparison with three cases of original Vanek’s series. Ann Diagn Pathol. 2003;7:337-47. 2.Greenson JK. Gastrointestinal stromal tumors and other mesenchymal lesions of the gut. Mod Pathol. 2003;16:366-75. 3.Liu TC, Lin MT, Montgomery EA, Singhi AD. Inflammatory fibroid polyps of the gastrointestinal tract: spectrum of clinical, morphologic, and immunohistochemistry features. Am J Surg Pathol. 2013 Apr;37(4):586-92.